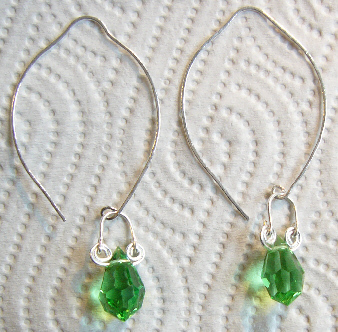 The 50mm long loops are hand-forged from Sterling Silver (925/1000) and the green drops are commercially manufactured crystal glass. (The green is actually a bright peridot-green.) N.B. Although they look a bit lemon-shaped when off, once in the ear the earwires appear to be 'hoops'.